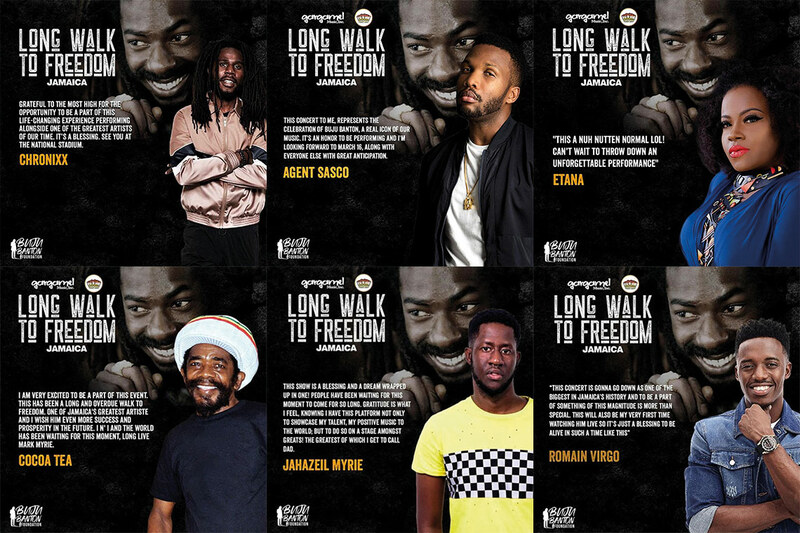 Buju Banton - Long Walk To Freedom Concert in Kingston, Jamaica @ National Stadium - March 16th, 2019! UPDATE: WATCH THE LIVE STREAM HERE! The stadium with a capacity of 35,000 will be packed with fans from all over the world to celebrate the return of Buju Banton! A few hundred bleacher tickets are left, but there will be NO tickets at the gate! CHRONIXX Jamaica grateful to the most high for opportunity to be a part of this life-changing experience performing alongside one of the greatest artists of our time. It's a blessing. see you at the National Stadium. DELLY RANX This is history being made before our eyes & I am honored to be a part of history. It is truly great to be a part of this massive celebration for the return of my brother Buju Banton. AGENT SASCO This concert to me, represents the celebration of Buju Banton, a real icon of our music. It's an honor to be performing and I’m looking forward to March 16, along with everyone else with great anticipation. ETANA This a nuh nutten normal LOL. Can't wait to throw down an unforgettable performance. COCOA TEA I am very excited to be a part of this event. This has been a long and overdue walk to freedom. One of Jamaica's greatest artiste and I wish him even more success and prosperity in the future. I n' I and the world has been waiting for this moment, long live Mark Myrie. JAHAZEIL MYRIE This show is a blessing and a dream wrapped up in one! People have been waiting for this moment to come for so long. Gratitude is what I feel knowing I have this platform not only to showcase my talent, my positive music to the world: but to do so on a stage amongst greats! The greatest of which I get to call Dad. GHOST I am overjoyed to say the least. Firstly, to be able to see with my own eyes, in the flesh, my friend and fellow brother in the industry Buju Banton. I am blessed to be even considered for this celebration and I’m looking forward to delivering in full strength at the Long Walk To Freedom concert on March 16th. L.U.S.T. We are honored to show our respects for Buju. We recognize the enormity of this event and the anticipation of the world. You can't arrest, imprison or even kill a legend. It transcends all boundaries to warm souls and enrich spirits. Buju Banton is a legend.